If you've been following our adventures on this blog you know that one of us (me!) has taken quite an interest in designer chairs. I have long been searching for the perfect molded plastic Eames chairs, and have been tempted many times by Overstock.com's near replicas. 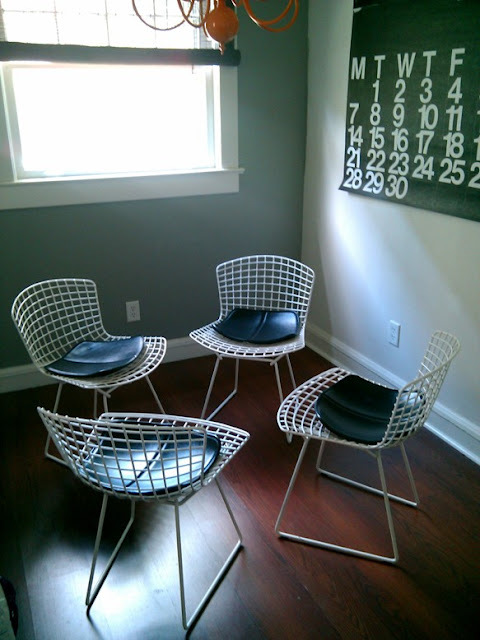 In addition, I have set my sights on Bertoia chairs, seeing them pop up everywhere from the MOMA (I <3 NY) to my favorite design magazines and the living/dining rooms of other design blogs I frequent. It's a shame either chair, brand new, will break the bank at anywhere from a whopping $200-$600 a piece! As an avid fan of Craigslist---okay, an obsessive fan--- I am always searching for great pieces and a great deal. And should either of said chairs ever pop up there, I waste little time in contacting the poster. Today we give you Reason No. 4,568 of why CL spells "love" for us and a brief history of Harry Bertoia and the famous Bertoia chairs courtesy of designaddict.com. Harry Bertoia emigrated to America in 1930. He studied at the Cass Technical High School in Detroit and trained on a scholarship at the Cranbrook Academy of Art, Michigan. From 1939 to 1943, he set up a metal workshop and began to teach jewelry and metal working. In 1943, he worked with Charles and Ray Eames for the Evans Product Company where they experimented on molded-plywood seating. In 1950, he established a studio in Pennsylvania and introduced his famous 'Diamond' chair made of welded steel lattice work. Later came the also famous wire side chair. The success was immediate and in the mid-50's the royalties he received for these chairs allowed him to devote himself exclusively to his sculpting career. That being said, there are two kinds of Craigslist Posters. Those who know better. And Those who don't. I am a big fan of the latter. Today it is with great honor and total giddiness that I present our breakfast nook in the making. As we continue to pull our kitchen together and round out the finer details, the posters who do not know any better, have offered up 4 new additions at the bargain price of $100. Total. All 4. Clueless. Just the way we like 'em! You'll just have to imagine how incredibly geeked out with excitement I was and how difficult it was to hide it, as he named his price for all four. They were "left in the house when we bought it and we have no need or desire for them." That might be the most beautiful thing I have ever heard anyone say. Evan - Grandpa took some night-school design classes at Cass Technical school in Detroit yeeeears ago, if I remember right. I have to say how jealous I am of your luck with craigslist!!! I can't ever find ANYthing I'm looking for and if I do find what I'm looking for, it certainly isn't a bargain! Nice find! !